For a couple weeks I noticed that my driver window had developed quite the "shimmy" when it was doing up and down. Of course pulling out of the parking garage at school, rolling down my window to swipe my card, it went bang and shark-finned in the tracks. The 9-5's window regulators (that's the whole scissor-lift assembly) are actually of pretty decent quality, it's just these dumb little green rollers that fail. I knew exactly what my problem was without even taking anything apart so I drove straight to Manny's Imported Auto in North Windham, CT. Sure enough they had a bag of them at $7.50/per. The guy I talked to was very nice and very helpful, offering me some great pointers to get the job done. 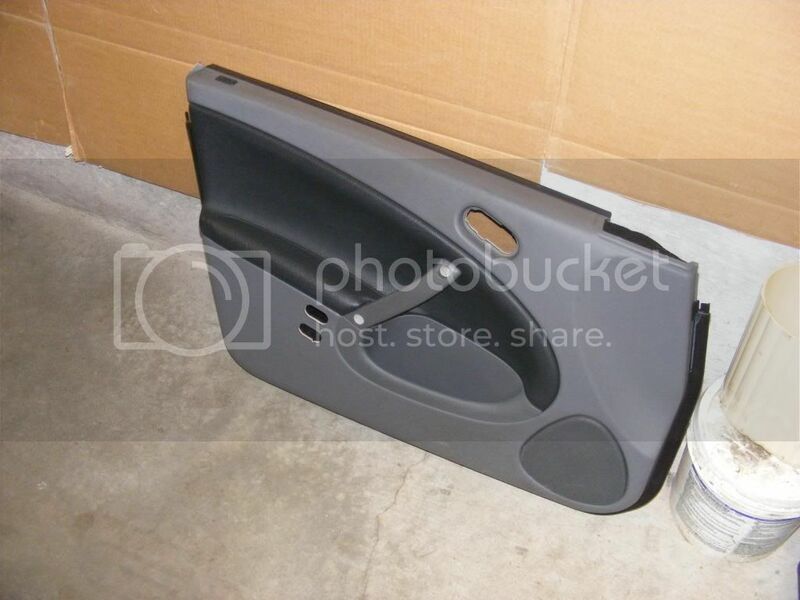 The first thing you need to do is remove the black plastic trim piece that surrounds the interior top and sides of the window. It's just clipped into place and comes off with a few good tugs. It's a bit brittle so use care. Unplug the wire harness on the mirror switch and put the trim piece aside. You may want to shut the interior lights off by the sunroof switch so you don't drain your battery with the door open and lights on. There are three screw covers that need to be removed using a tiny flat-head screw driver. One black one in the handle and two of the grey variety in the door-pull. Next, using a Torx T30 bit, remove the three screws that are now uncovered. They're all the same so there's no need to worry about mixing them up. The door handle pulls straight out. Notice the little metal tooth right above my thumb nail. That fits into the little mechanism peaking out from behind the grey door panel. Remember this for re-installation. There are a bunch of white plastic clips around the perimeter of the door panel. I gave a nice hefty tug on the door pull and they all popped out at once, but if yours are more stubborn you may need to carefully pry them out with a flat head screw driver. Now that the bottom and sides of the panel are free, the top is secured by the black strip along the bottom of the window glass. I found it easiest to start toward the front of the door (by the mirror) and pull STRAIGHT up on the whole panel and working your way back. It lifts straight up over the lock pull. The black strip IS NOT supposed to separate from the rest of the door panel. These are the trunk and fuel door release buttons from the back side. Squeeze the clips and push the buttons out the front of the panel, and unplug them. Everything is idiot-proof and notched or color-coded so you can't switch anything around upon re-installation. 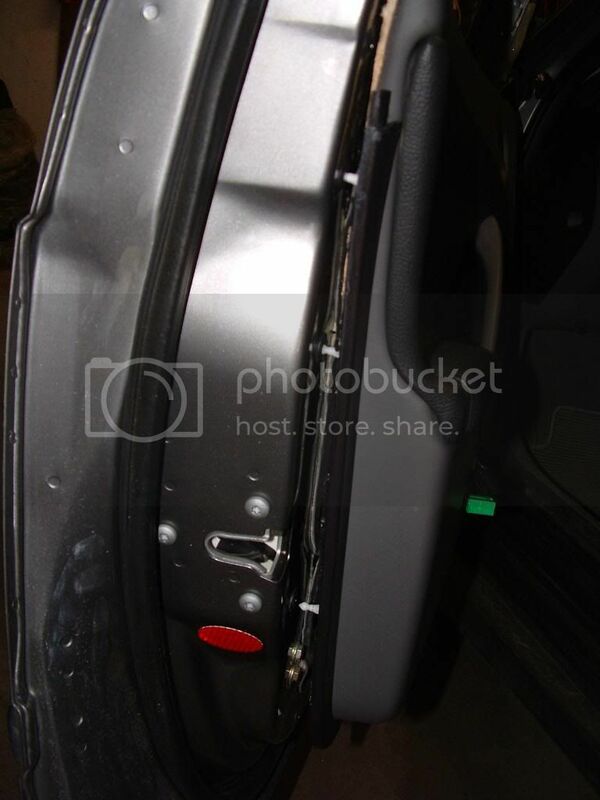 You also need to remove the puddle light from the bottom of the door panel. This bulb is HOT if you've had the door open for more than 30 seconds, and will melt the door panel and not smell good (or burn you) if you let it touch, so be careful. If you're reading ahead you might want to remove that light before you start anything while it's cool. 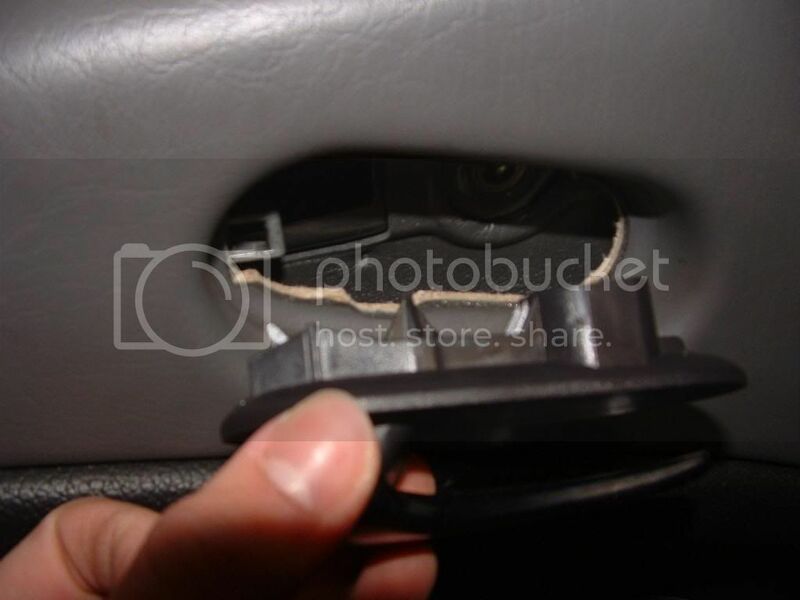 There's one of those black push-pin clips on the bottom of the door panel, you don't need to remove it. Place the door panel aside. Here's what the door looks like with the panel off. Out of this whole project this next part is the suckiest. You have to pull the weather barrier off without ripping it. It's a royal PITA. The glue seems to do a good job of resticking though when you're buttoning it all back up. This is as far as you have to go with the weather barrier to get access to the window mechanism's "guts." Carefully roll the window down so you can see the bottom of it in the lower access hole. And here's the trouble-maker. Slide the remaining piece of roller out of the track. It justs slides out the end. Then remove the securing pin from the regulator arm and remove the other half of the broken roller. I lubed the inside of the new rollers with some thick silicone grease. DO NOT REMOVE THE SECURING PIN FROM THE ROLLER!!!! Slide the new roller into the regulator track, and line up the pin on the regulator arm to go into the roller. When you push the pin into the roller there need to be TWO CLICKS!!! The first click you can do with your hand and that's the pin passing over the securing pin. (The securing pin I'm talking about is the bent squiggly one in the roller, the other pin is riveted to the regulator arm and that's what fits into the hole in the roller). ...and spread it around with my screw driver and ran the window up and down to work it in. Make sure you replace BOTH rollers while you're in there. The one on the right failed totally, and the one on the left had a crack in it and probably would have failed pretty quickly if I hadn't replaced it. I didn't document putting everything back together because everything just fits back into place in reverse order. Feel free to leave a comment down on the bottom if you have a question or I wasn't clear about anything. Good luck! This was very helpful when I recently had to replace these on my saab. Just wanted to add to anyone about to do this to also make sure the window is in its track, especially on the side closest to the hinge. This might seem commonsense but it was not apparently obvious and I broke a second roller before I figured this out. Otherwise this post was great. Thank you! Pls kindly advice me that how's bonded when the refitting weather barrier. I don't understand what you are asking. If you can clarify for me I will try to help as best I can. does anyone have any aligning tips as there is some amount of play when you bolt it all together again, now mine seems to try to push more to the rear of the window even though every moving part is 'lubed within an inch of its life ? just got done replacing both my rollers on passenger side your pics where a great help thank you. Thanks for the great write up. Just replaced a roller and this article was a huge help. One thing I would add is to reset the window stop. I think this is why the rollers break. The stop was set so it was not even in the equation when the window shuts. I only replaced one roller as an experiment to see if it is indeed the stop that causes the roller to fail. Also removed and refinished my mirror triangle today.. I bought a dozen of these effers from Rock auto not too long ago for just over a $1 or so. Keep them in the car for emergencys. Is this gap in the window trim normal?